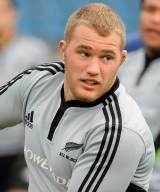 A mobile, powerful tight-head prop, Owen Franks has become a key member of the All Blacks front-row over the past year. Franks made his international bow as a replacement against Italy in June 2009, capping his first year of Super 14 rugby with his first All Blacks jersey. Having followed his brother, Ben, through the ranks at Canterbury and later the Crusaders, he then got his first taste of Tri-Nations competition in a lively performance as a replacement in a victory over Australia at Eden Park the following month. Franks was sprung from the bench once more against the Springboks before earning his first start in the subsequent Durban clash with the world champions in August. He was included in the end-of-year tour of the northern hemisphere and has gone from strength to strength ever since and went in to the All Blacks' 2011 World Cup campaign on home soil as their first-choice tight-head. He went on to be one of the stand out props of the tournament as the All Blacks prevailed in the final against France.